With the new WAMM, an entirely reconceived version of the legendary original, David Wilson has broken new sonic ground. Wilson has gone to considerable lengths to refine its emphasis on the time-domain—here via the ability to adjust the driver modules for optimal sound reproduction—down to five millionths of a second. This helps provide a vanishingly lower noise floor that supplies the foundation for the WAMM’s sonic prowess. Its scale and dynamic power have to be heard to be believed, and even then it requires something of a mental adjustment to comprehend just how expansive a soundstage it reproduces. New subwoofers, boasting three drivers each, complete the package. A big room is a must. Despite its large size, however, the most beguiling aspect of the WAMM may not be its capacious soundstage, deep bass, or seemingly limitless dynamics. Rather, it is the ability of the loudspeaker to draw you into the music, banishing any sense of electronic haze or glaze. The WAMM possesses a limpidity that allows it to shine on vocals, while presenting any accompanying instruments and voices as something more than vague ancillary adjuncts. It is literally and figuratively a towering achievement. Demetris Baklavas, the head honcho of Ypsilon electronics, has been steadily refining his products over the past decade. The results speak for themselves. 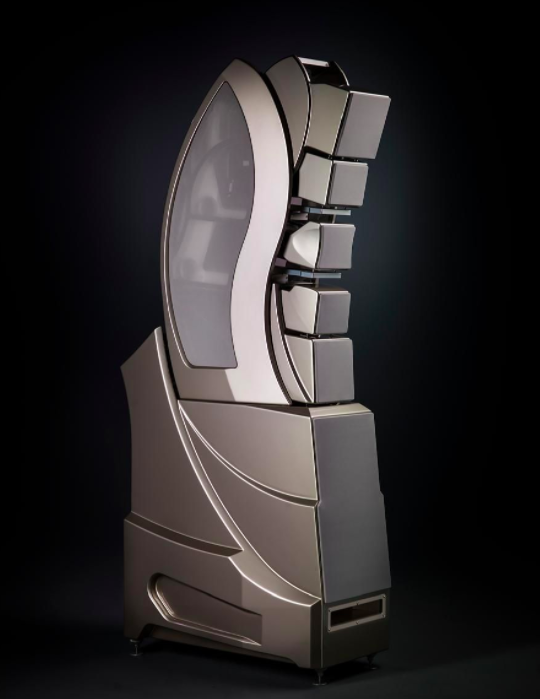 His latest creation, the 400-watt monoblock Hyperion, named after the Titan god of heavenly light, is a high-powered, hybrid amplifier that combines the finesse and alacrity of his previous low-powered designs with tremendous clout. The transparency, detail, and delicacy of this amplifier are indeed quite divine, but its ability to control the bass also rivals, and may even exceed, some of the most high-powered purely solid-state designs. The depth of soundstage is stunning and the treble region is seldom less than seductive. If you’ve always yearned for high power, but shied away from it for fear of sacrificing refinement on the altar of high wattage, the Hyperion may prompt you to think again. 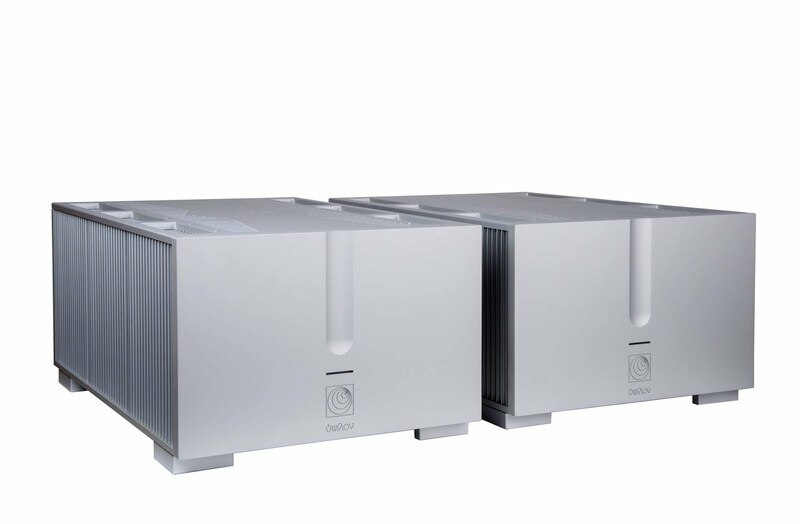 With the first 120 watts running in pure Class A, sonic purity is almost a given, but it is also the case that the Hyperion inevitably runs quite hot. Compared to some of Dan D’Agostino’s earlier creations, the Momentum monoblocks are diminutive in size, only about 4 inches high. But in this case looks can be deceiving. 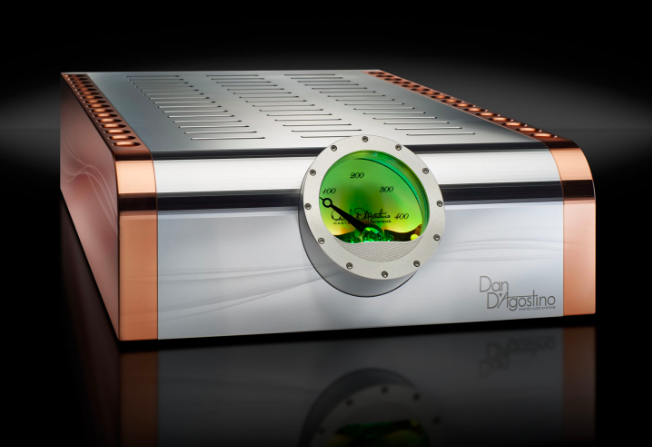 The copper chassis not only means that the amps weigh a lot, but also provide excellent heat-sinking that allows D’Agostino to avoid creating an obtrusive behemoth. The Momentums are sleek and refined, both in appearance and sound. D’Agostino has raised the power output from the first version Momentum of 300 watts to 400, deploying an 1800VA linear transformer. The result is a richer and more tuneful sound. What’s more, a recent tweak to the bias adjustment, raising it slightly, has also had a markedly salubrious effect upon the sound. The earlier version of the amplifiers sounded exceedingly smooth, almost tube-like, but lacking in the ultimate dynamic oomph. No longer. Now the Momentums pretty much deliver it all—an immense soundstage and unrelenting control of the bass region. Sound pressure levels seem pretty much limitless with this amplifier. The nifty watt meters in front of the amp barely budge, unless you start to play rap music at terrifying levels, and even then it’s hard to get them moving much past the 100-watt level. With its transparency and sinuosity, the Momentum shows just how far new designs have progressed in effacing the old divide between tubes and solid-state.